Students work on building covered wagons. 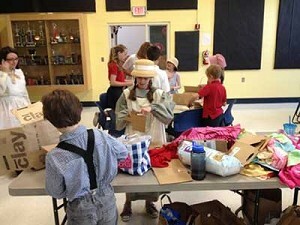 Fourth graders from Holy Family School in Southeast Portland took part in Pioneer Day in May. To culminate lessons on pioneer life and westward expansion, the fourth graders dressed as pioneers and undertook five 19th-century engineering challenges. They were to build a miniature covered wagon, ford a river with the vehicle, construct a temporary shelter for four pioneers, make a barrel and produce a ball-and-cup toy. The students used craft materials and household recyclables and learned that a problem has many viable solutions. The fourth graders enjoyed biscuits with butter they churned and tried “Pioneer Lemonade” or “haymaker’s tea,” made of water, vinegar and ginger. Anna Waldron “loved how organized all the stations were” and proclaimed Pioneer Day a highlight of the term. Catherine Hopman gave the day a five-star rating.